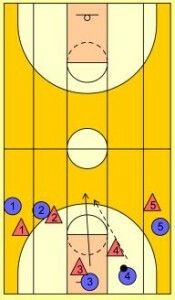 I have not used this drill, but it is one that I think is worth experimenting with for 10 or 15 minutes to see if it is worth continuing to use in your program. I think it is worth experimenting with new ideas each week in practice to see if they will improve your program. 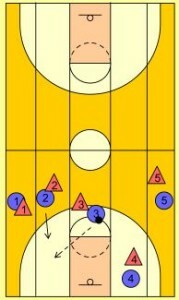 I have posted a similar drill using 3 lanes previously. With 5 lanes in the drill, one of the main teaching points is spacing on the passes. You can vary the drill by making teams compete against each other for the least amount of passes required for completion or by timing each team. This drill emphasizes man-to-man defensive coverage, develops the ability to pass and catch under pressure, and develops team communication and court spacing. It is a great way for players to develop the ability to get open. The drill is very effective in teaching intensity and internal motivation, resetting without dwelling on the mistake, and working together. Assign each pair to play in one of the 5 lanes as designated on the diagram. Neither member of this pair is allowed to go outside of their lane. You can use floor tape or markers such as cones or spots from PE classes to mark the lanes. The offense has completed the drill successfully when one of the offensive players receives a pass while standing on the opposite baseline. Once an offensive player receives a pass, they must yell out the number of passes they have received. This will help the offense know when all 5 players have caught 2 passes if you are using that rule. 1. No dribbling. Get your players used to pivoting under pressure. 2. If the defense steals the ball or causes it to go out of bounds, the offense must reset at the baseline. Insist that your players reset without instruction. 3. A loose ball can only be retrieved by the person in the lane it is in.